The mission of the Flock is to support anyone affected by Substance Use Disorder. The Flock spreads awareness of Substance Use Disorders and Recovery at SJU through an open dialogue and provides a supportive environment and a safe zone for anyone impacted by Substance Use Disorder. Please consider joining the Flock to help support the recovery efforts on campus. To join, email flock@sju.edu. What does the Flock do on campus? Drugs Over Dinner: At this workshop, Flock members will show a short video then discuss it over a delicious meal. True Story-I’m in Recovery: In this informal workshop, a Flock member will share their own experience with addiction and recovery and answer questions from the crowd. If you are looking to bring a workshop into your group meeting, club or classroom, request a workshop from The Flock. 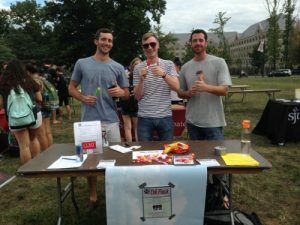 Awareness Campaigns to educate the campus such as Allies of Recovery tabling activity, The Fine Line Between Abuse and Addiction display and other social media campaigns. Educational Events in collaboration with other students organizations or departments such as Recovery Rally, Substance Use Disorder Speak Out, Black Out Day, etc. Why should I join the Flock? Hawks fly together to utilize each other for support during a long journey. Flying together in a upward spiral allows each Hawk to conserve energy, soar higher and keep up the endurance needed to make the long flight. This is what the SJU Flock does as well. It is a group of students who support one another in the lifelong journey of recovery. They have fun with their peers and enjoy helping others in their community to realize a satisfying and productive lifestyle. By joining The Flock, you will meet many new friends and find a supportive environment. And you can gain skills that will transfer into any professional setting. Regardless of Flock membership, you can also sign up for the The Flock E-newsletter which will come with information on recovery events on and off campus, highlight meetings in the area, share bios and interviews with people in long term recovery and include inspirational recovery readings for reflection. This E-Newsletter comes out twice a month during the academic year and once a month over the summer. Is “The Flock” For You?